BAHARIYA OASIS, EGYPT (31 March 2018) — This morning I was bundled off into a beatup old Toyota by a very kind bedouin driver to make the highway transit from Giza to the Western Desert. He didn’t speak much English, but introduced himself as “Mr. 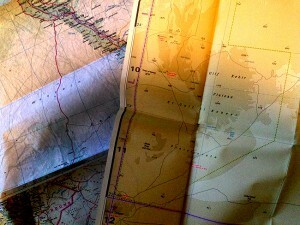 Abdel” and offered me a falafel and a coke as we barrelled down the tar road and away from the urban traffic towards the open desert. He told me it should take four hours and that I could sleep, but I was more interested in watching the transitions of the desert landscape along the way. Normally I would prefer to do this drive myself, slowly and off-highway, so I could feel the desert changing and appreciate its nuances, but for this trip a combination of my own short timeframe and the Egyptian government’s security restrictions put me in Mr. Abdel’s good hands from Giza to the Bahariya oasis, where I would get my 4×4 Toyota Land Cruiser and meet my local bedouin team. The urban sprawl slowly spread out with lots of new construction going up along the edges, reaching further and deeper into the vastness of the desert. And then it trickled off. A last big gas station and a very big military checkpoint marked the passage, though we were not stopped and nobody seemed to really be “checking” anyone at the checkpoint. We slowly rolled through, observed from a distance by a soldier manning a high observation post, and continued on our way. In my mind this was the “border” of “The Western Desert,” the vast stretch of Egypt that lies west of the Nile and is mostly empty. 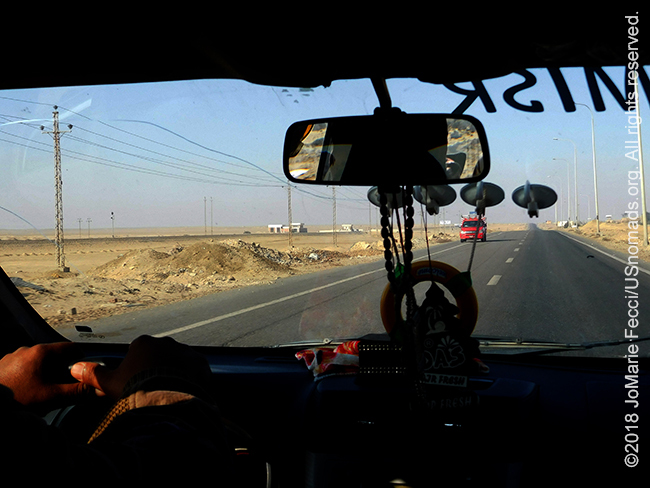 The road was well-maintained and we could move pretty fast without much traffic, and Mr. Abdel drove quickly. I watched the desert pass by through the window and really would have loved to stop, but I understood that on this “transition mission” I was not in charge. I was a “passenger” to be delivered safely to the oasis. As the desert rolled on, there were a number of oil and/or gas installations dotting the landscape, though I hadn’t known Egypt even had oil. The familiar pumps made it clear they do. Other than these installations there didn’t seem to be much of anything else around. The terrain was flat and open without even any distant features to “navigate” by (though we were on a tar road — the only road — so “navigation” was not an issue). Eventually after a few hours we came to a small building in the middle of nowhere and nothing, just beside the road. This was a “rest stop,” a small coffee shop, dark and somber inside. I took my drink outside on the terrace where Mr. Abdel and a couple of other drivers also sat until the wind started blowing sand into our coffee and we all went back inside. When Mr. Abdel was ready he signaled for me to get back in the car, and we continued south and west on the road, until finally the landscape showed some features again. 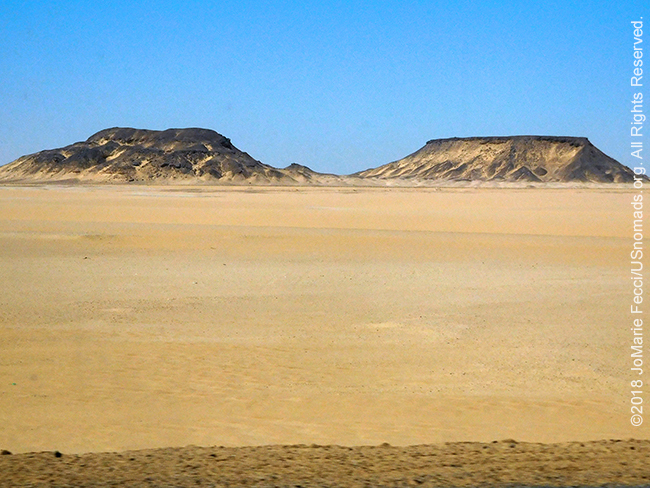 I started to see hills and a few distant mesa-like formations, followed by a line of sand dunes. From time to time we passed road crews surveying and working on expanding the highway, and I wondered how they got here and where they stayed as there was no shelter and no shade. Eventually I saw a thin layer of black sand in spots, and I recalled my experience with the Tuaregs in Algeria who explained to me that one of the ways they navigate the desert is by seeing the color of the sand. I knew we were headed to the “Black Desert,” so I assumed we were now approaching it.